I’ve been blogging for 13 months. What were your main reasons for starting a blog? Fashion has always been a passion of mine. I was, and still am the go-to person whenever friends or family are in need of finding their personal style, or simply putting random pieces together. This inspired me to believe that there are more people out there also in search of styling tips. As this was my “ah-ha” moment, I decided that a blog would be perfect for those searching for a style like mine, or similar. My main focus is to help motivate them to be confident in themselves. I’m inspired by everything! It could be a song or a random picture hanging on a building that would produce my next outfit. Since I try to look at life in a positive manner, everything is attractive. I am able to capture life and transpire it to have it reflect through my outfits, and especially my accessories. Because I am a full-time employee, and to mention full-time student, time is very limited. When I have the chance to stop and smell the roses, I devote my time to my loving husband who has supported me since day one. When I’m with him, everything balances out, especially during times when my to-do list can be overwhelming. I’ve been residing in San Diego for 3 years and absolutely love it! This city is filled with lots of history, wonderful people, and beautiful scenery. I still continue to discover new places and restaurants...so much to do! My husband and I are enjoying every second here. What advice would you give to others who would like to begin blogging? Maintaining a fashion blog takes a lot of time and effort so you will need the passion to help you stay motivated. Focus on what you love and start from there. Don’t be too discouraged if you don’t have many views or followers. It’s all about baby steps in this business. Someone will be touched by your story and you will slowly get the hang of it all. Although blogging community can be intimidating, nothing is worse than living your life wondering what could happen. Don’t let anything hold you back and follow your passion! Most importantly, HAVE FUN! 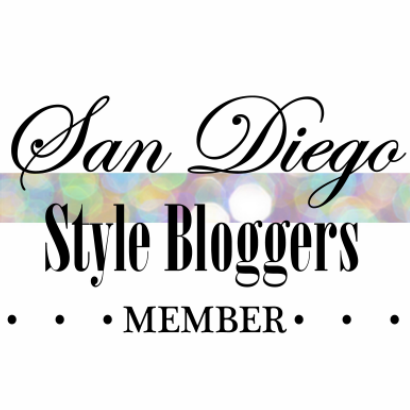 *If you are a Style Blogger in San Diego and would like to be added to our blogroll and/or featured email us at SDStylebloggers@gmail.com for more info! SD Style Bloggers Now On YouTube! THIS FRIDAY: SDStyleBloggers Blogiversary Party!